Curious about Master programmes available in – and beyond – Maastricht? Want to know what your options are after graduating from your bachelor’s degree? Well, we got you! 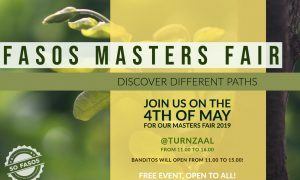 Join us for the FASoS Masters Fair 2019 and come find out more about different programmes available across Europe! Over 14 international universities will be attending the SoFASoS annual fair, including HEC Paris, Universities of Essex, Webster University of Leiden and more. Come with your friends to enjoy a sunny day at the faculty, grab a cup of coffee at Banditos and check out all of the different masters and career opportunities your programme gives you access to.